Twinkling like the stars in the Northern Skies…. 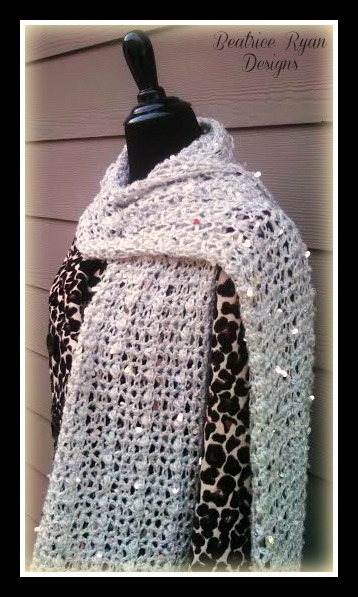 This Beautiful Crochet Scarf is an easy Free Pattern to whip up in one weekend!!! 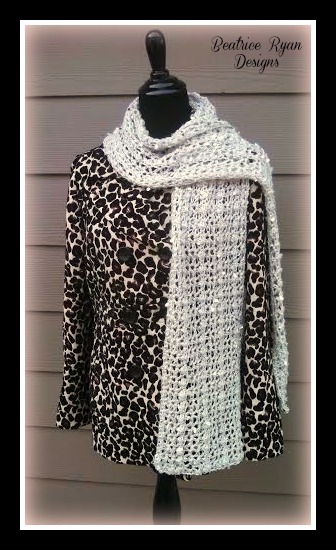 Just in time for your Holiday Parties… This Northern Nights Scarf will make your special outfit shine!!! If you love this pattern, you can add it to your Ravelry queue and favorites.. Click Here!! Bobble Stitch ~ YO, Draw up a loop 3 times all in the same stitch, YO and pull yarn through all 7 loops on hook. Row 5: Ch 1, Turn, Sc in the 1st 2 Sts, *Bobble St in center of V St from previous row, Sc in next 2 Sts*, Repeat * * across to end. = 71 Bobble Sts and 144 Sc. Finish off, Weave ends in. Block Scarf using either the Wet Blocking Method or Steam Blocking Method. Congratulations… You are now ready to enjoy your Northern Nights Scarf!! **Tip ~ You can continue in the pattern stitching repeating Row 3 twice, Row 5 and Row 6 to make this Northern Nights Scarf wider and into a Shawl!!!! This scarf is just stunning. Perfect for Spring! Beautiful scarf! Thank you for sharing. What you are describing as a “Bobble” stitch is what I know as a “Puff” stitch. A Bobble stitch is 5 DC in one stitch with ultimately 6 loops at the end. You are describing simply a YO and pull up a loop with a total of 7 loops at the end. That’s what I know as a Puff stitch. I just wanted to clarify if it is Puff or Bobble (with Bobble meaning 5 DC tog in same stitch). Thanks! Bobble and puff stitches can be used pretty loosely… Usually the bobble you yo and pull up any designated amount of loops then pull the yarn through all the loops to finish,,, Puff stitch you yo and pull through 2 loops and repeat that any designated amount of times then draw through the last 2 loops to finish… But each designer uses them differently… so if you just follow the written directions in this particular pattern for the special stitch… you will do it correctly. I have some wool blend thick thin yarn that this pattern may be perfect for. 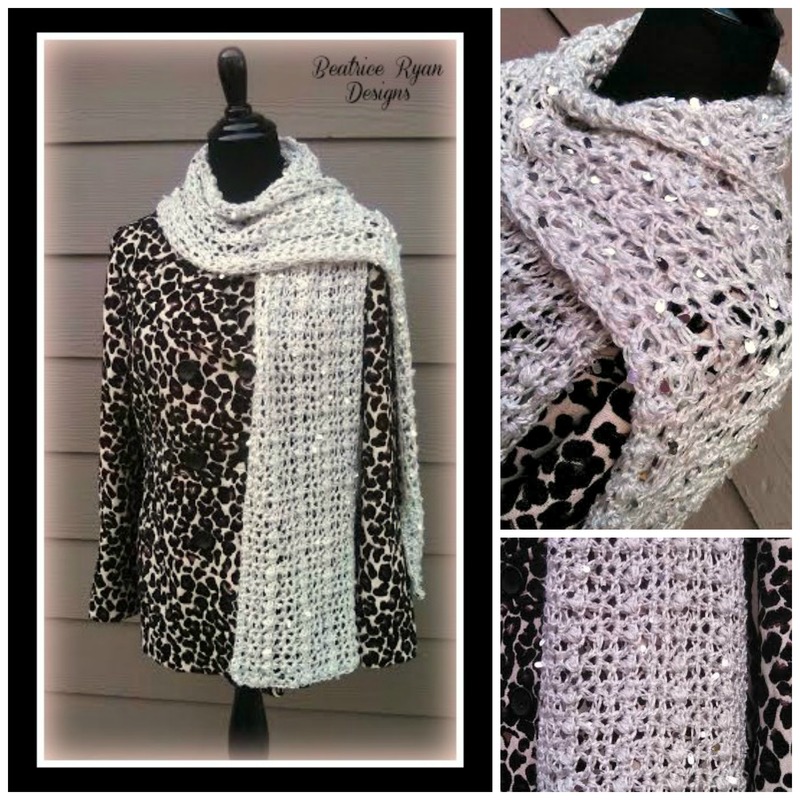 Thank you for posting this free pattern!